Fr Amado Baranquel, pastor at Tripoli's Church of Mary Immaculate, appeals to his government after Islamists killed a 50-year-old Filipino "for not being a Muslim." The cities of "Benghazi and Tripoli are under the control of militias," with "tanks, the gunshots, and explosions." 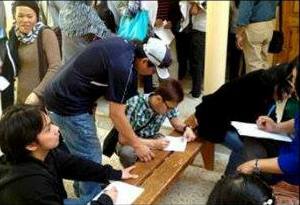 Manila (AsiaNews/CBCP) - As Libya's political crisis plunges the country into ever greater chaos, a Filipino priest in Tripoli urges his government to ensure the safety of some 13,000 Filipinos trapped in the country. Fr Amado Baranquel, pastor of the Church of Mary Immaculate in the Libyan capital, issued his appeal after radical Islamists killed a Filipino in Benghazi "for not being a Muslim." The victim was a 50-year-old construction worker who was abducted and killed on Wednesday. This has caused panic among Filipinos in Libya who are unable to leave because ports and airports have been destroyed. For Fr Baranquel, the current absence of Filipino ambassador Oscar Orcine, has made it difficult to ensure the safety of 13,000 Filipino migrants. For this reason, he has called on Foreign Secretary Albert del Rosario to send the diplomat back as soon as possible. "Benghazi and Tripoli are currently under militia control, hence the tanks, the gunshots, and explosions. There is this hospital from which people had to be evacuated, including many Filipinos, because of the constant firing in the area. You can really feel the tension everywhere," the clergyman said. As he waits to leave Libya, he urged his countrymen not to panic, but "pray instead for the safety of their loved ones".